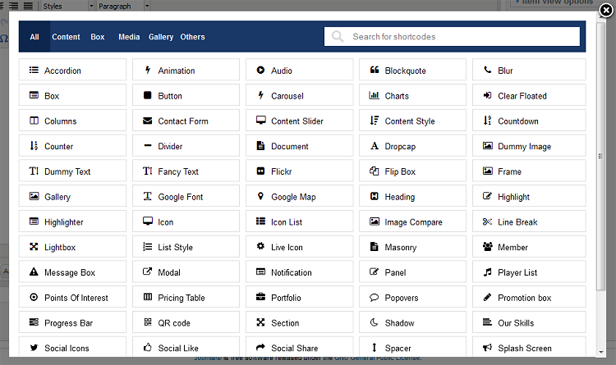 Built on YT Framework V3, this template is very flexible of using as well as customizing for users. 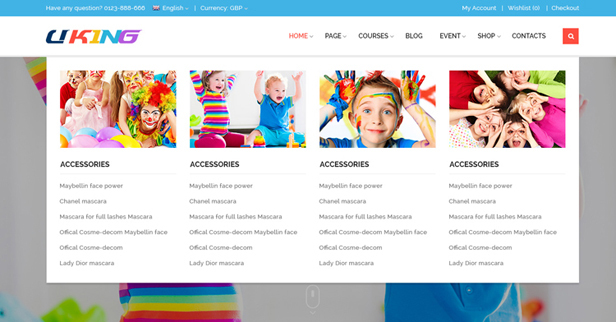 Besides, the template comes packed with dozens of advanced in-house modules intuitive features: a unique homepage with 4 styles of layout: Boxed, Wide, Framed, Rounded; 5 Beautiful Colors for children-Styles (Blue, Green, Yellow, Orange, and Red) ; powerful mega menu; more 65+ useful shortcode, etc. 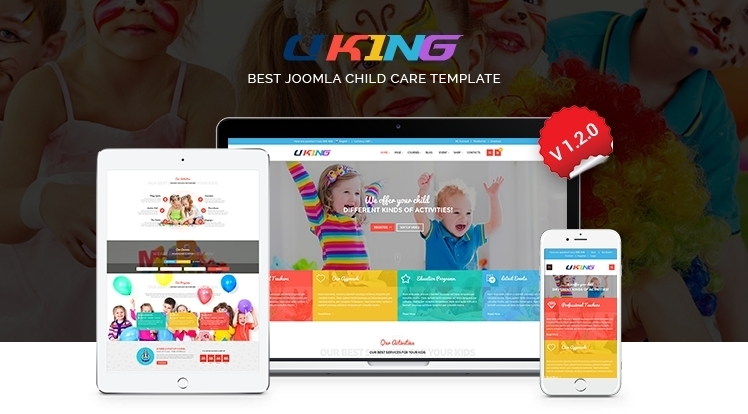 SJ Uking has only one homepage layout with the beautiful pre-schooling style that brings the comfortable feeling to users. In addition, We are developing other homepages for this template with the topic related to Education in next version update. SJ Uking is built with new web technologies: Bootstrap 3 ( V3.3.0), Awesome Google Font, LESS, CSS3, HTML5 that makes it more powerful and flexible. Based on YT Framework v3, SJ Uking will bring to customers a great look on any devices: PC, mobile, iPad... or any screen resolutions.Let experience it! 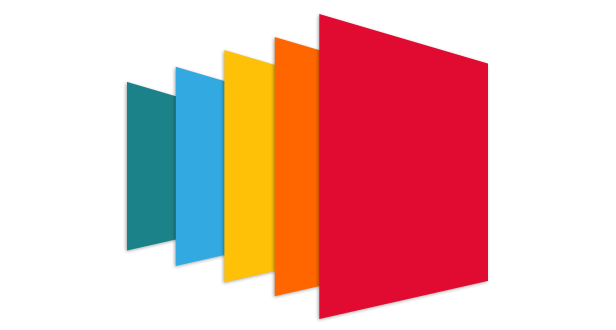 This template is available in 5 color styles: Blue, Red, Orange, Green, and Yellow. Besides, it allows you to fully customize color schemes in the back-end. With mega menu, you can show categories and news with description, image, video, effects… or even add links to any page, static blocks with promotion banners and modules. SJ Uking will attract you by its services with "Search Course" including Courses, Classes, Time and etc. It is very convenient for any customer who is tending to refer these services in any course. SJ Uking will bring many surprising activities for children with indoor and outdoor activities. 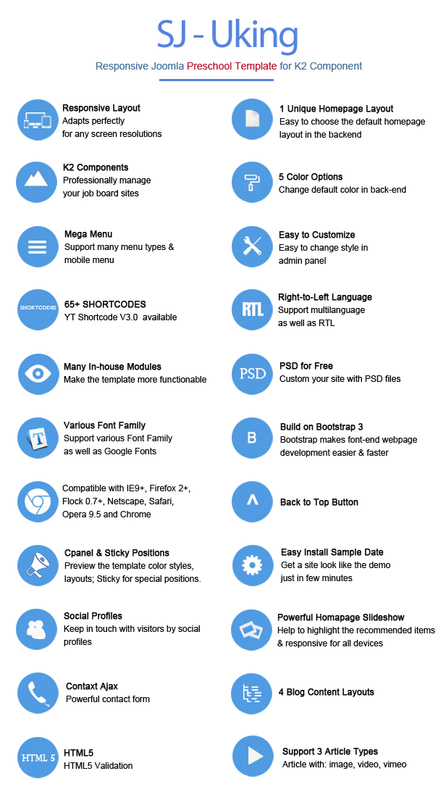 Powered by YT Shortcode, SJ Uking comes with 65+ useful shortcodes that help you more powerful in building and customizing your site. You can easily build a various website content without much coding knowledge required.